I’ve had so much going on this week, any of which could merit a blog post on its own. On Monday I tested out my new kettlebell workout. I have to say, it looks really simple on paper and only takes me about 25 minutes to complete, but boy it certainly gives me a workout. I did a tough pilates session on Monday night and was wondering why my arms were really aching in the plank and then I remembered what I’d already done. Tuesday night, I joined Wallsend Harriers again for another club night. It was similar to my previous session with a warm up run out to a hill, then hill reps and short sprints. They also did a longer stretch of speed work that I messed up a bit. I wasn’t sure how far we were going and tried to stick with some of the faster girls, but couldn’t make it stick. When we repeated the rep, I ran at my park run pace and felt a lot more comfortable. I get a good hour’s worth of training with the club run, so I think it’s a valuable session at the moment. I took a day off training on Wednesday as I had the more important task of welcoming my good pal Alastair and his lovely wife Lorna back to Tyneside. We had a fabulous evening catching up on Newcastle Quayside. Lots of talking, lots of eating very nice food and just generally the best kind of evening you can have with your friends. I felt very spoiled. I was still up and raring to go early on Thursday morning for my PT session. The skies were perfectly clear and as I stepped out into the chill morning, the darkness was lit with starlight. And as I trained on the beach I watched the sun come up, rosy red over the waves. It’s a real privilege to have the best moments of the day, moments other people sleep through. Me, I was far from sleeping. My PT is always looking for new and different ways to train his clients and he’d been hinting that he had something new for me to try. I don’t want to give away any trade secrets, because he works really hard at researching and coming up with ideas, but my workout this week had me bashing a tyre with a sledgehammer and lugging bags of sand around. Well, no one ever accused me of being dainty! Needless to say I loved it, and it gave my arms a really good workout. So much so that it actually hurt to brush my hair the following morning. By Friday I was ready to take it a bit easier, so I took myself for a swim. A chance to unwind, empty my mind and just enjoy some time in the water. Saturday I had planned to do a paced 10k run, trying to build up to a target race in a few weeks’ time. I’d orginally thought I’d just go and do my own thing, but then I figured that if I wanted to try and pick up the pace for the first few miles, then parkrun could help. So I went and ran a double, just stopping for long enough to scan my barcode and token before heading off on a second lap. I ran okay for the first 5k, dipping a bit under target pace for the 2nd and 3rd mile. But it was a bit blustery on the Town Moor and I was keeping in mind I had another lap to do. It was great to see Penny and her parents and dog and she certainly kept me honest through the first couple of kilometres, keeping the pace on. It was when I was running more on my own that I eased off a bit. Still I managed the usual sprint finish and a consistent time of 25:26. I ran the second lap a bit more slowly at around 9:00min/mile pace but it didn’t feel much easier. It was very strange running the route with no one in sight, knowing there would be people finishing and I’d be way behind the tail runner. It was a nice run though and I relaxed and finished the 10k in 52:43 – which I’m pretty happy with as a baseline for a training run. Today I had a long standing bike date with Peter. I set off in bright autumn sunshine, but after a bit of sat-nav tomfoolery I was plunged into fog and drizzle over the North Pennines and a rapidly dropping temperature gauge. But you can’t keep a good team down and Peter took me out on a nice out and back route that he’s testing for triathlon next year. It was cold, wet and rainy. The coldest, wettest and rainiest conditions I’ve ever ridden my road bike in. But I didn’t care. Once we got going, I remembered how much fun I can have on my road bike. The pace was easy at first and then as we turned and hit some downhills on the way back I gave it some welly and just enjoyed the sensation of the wind in my face and the bike beneath me. I even got up enough confidence to ride tucked and dropped. I love my bike! It wasn’t all plain sailing though. I do feel like I’m missing a bit of bike fitness and my legs were starting to tire. I’m also really stubborn and had ridden pretty much all of it on the big ring, just attacking the small undulations when they came. But eventually I had to stop being so pig headed and drop down and actually use my gears. Just because I can get up a hill in that gear doesn’t mean I should. I need to get a bit smarter about my riding. But today was just about getting out and having fun in conditions where I think both of us would probably have ditched the ride or called it shorter. Peter did do quite a few more miles than me, as after a bit of a thaw out in a convenient coffee shop he headed back on his bike and pointed me in the right direction to get home. By the time I got back to the coast it was almost 10 degrees warmer and sunny! So, all in all a pretty full on week. But a fun one and one where I got to spend time with some good people who have done so much to encourage and support me. I have some great friends, especially those I’ve met through running and training. 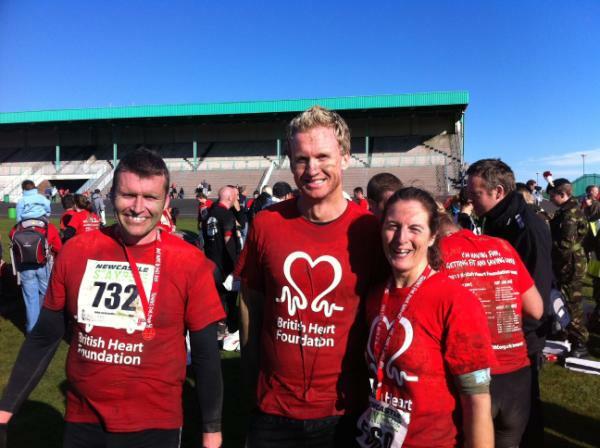 So this weekend was all about the Newcastle Stampede, or the ‘daft race’ as I’d called it. 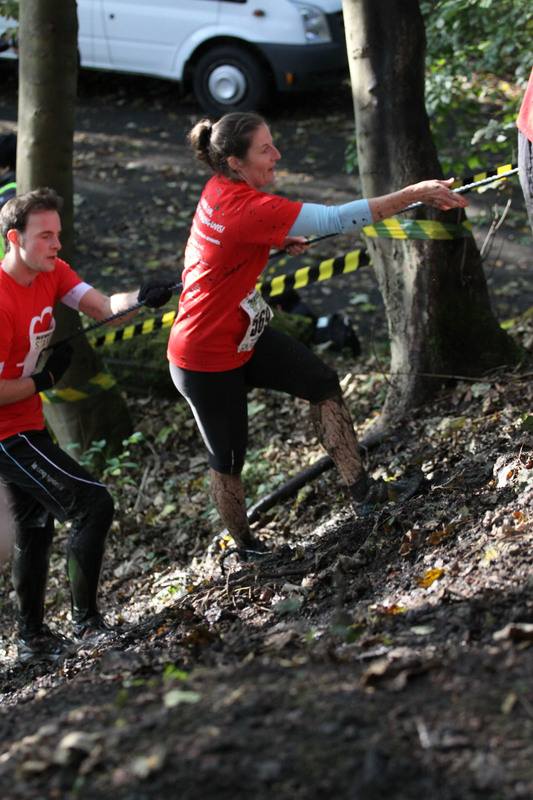 Billed as a 10k with obstacles, I’d seen a couple of people do this last year and it sounded right up my street. 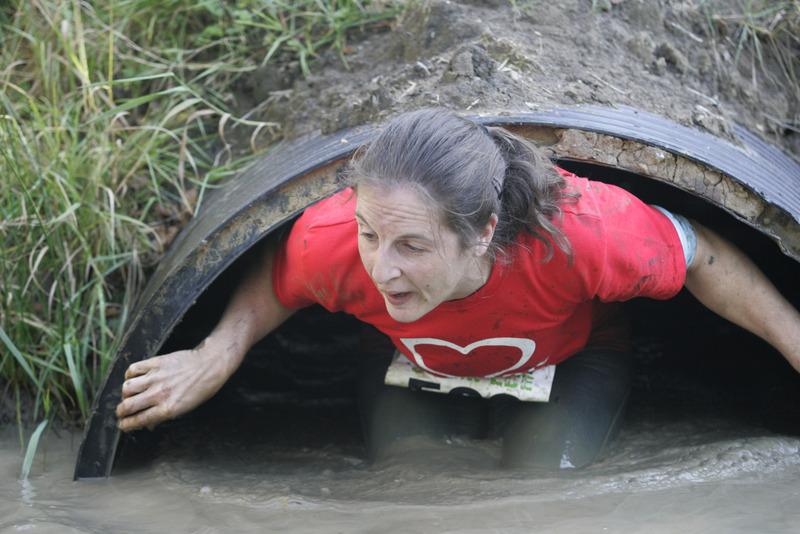 It promised mud, water and a challenge that I couldn’t predict a time for. So I was in. I was actually a bit nervous. I was looking forward to it, but not knowing what to expect gave me pre-race jitters. I turned up to race HQ at Gosforth Park race course and picked up my T-shirt, number and timing chip, stopping for a chat with Natalie from parkrun and then bumping into Peter who was on support duty. He kindly offered to look after my car key for me, but I didn’t manage to see him again after I went to get changed. I knew it would be muddy and Penny had warned me about the sticks and stones and potential scratches from the obstacles. But by the time I saw my PT, Ian and a couple of his other clients I was just wanting to get going. There was talk of barbed wire and much taping of shoes and loose bits of clothing, even a plea for gloves. But I think the boys were trying to scare me and I was having none of it. I was expecting a bit of a boot camp style warm up from what I’d heard about last year’s event, but we all just lined up on the race course and set off in rough groups of around 100 or so. We were near the front of the wave and set off at a conservative pace, running across the grass, with Ian saying he was just taking it easy to keep something in reserve for later on. I managed to stick with Lee and Ian through some woody paths and out onto a field stacked with haybales – our first obstacles. A bit of a run and jump to get my knee on and over the lower ones and then a real run, arms up and push up to get over the tall versions. At 6 foot odd, Ian had the advantage over me and was hurdling his way over, soon leaving me behind. Ten hay bales later and through the woods to our first dip into a cold muddy puddle up to my waist and then through a couple of tunnels that I managed to duck through quite easily. And then out into quite a good run over trails and through the trees. My feet were uncomfortable, shoes filled with stones but I managed to keep running and even stayed upright despite the muddy ground underfoot. Running through the trees over the autumn leaves and through the dappled sunlight, I absolutely felt in my element. Some of the other Stampeders were walking by now, but this was where I felt strongest and most confident, finding my feet with a nice easy paced run. I didn’t wear a watch of any sort, so I have no idea of my pace, but I was regularly catching and overtaking people and didn’t feel like I was pushing too hard. Time to get down and dirty in the mud with a plodge through a watery ditch filled with tyres and then a crawl underneath a wire mesh, face down with just a view of muddy trainers in front of me. More water obstacles, getting deeper and longer each time and a bit of a delay where people were going one by one through a water filled pipe and being papped by photographers as the shock of cold water hit their chests. You never really knew how deep the dips were. You’d start off in up to your knees or waste then wade forward and drop another half a foot or so. It looked like the tunnels filled with water were on the same level and these scared me a bit. But each time there was a hidden step up, so you went through crouched down, still up to your chest in water. I did have to take a deep breath before each one though. 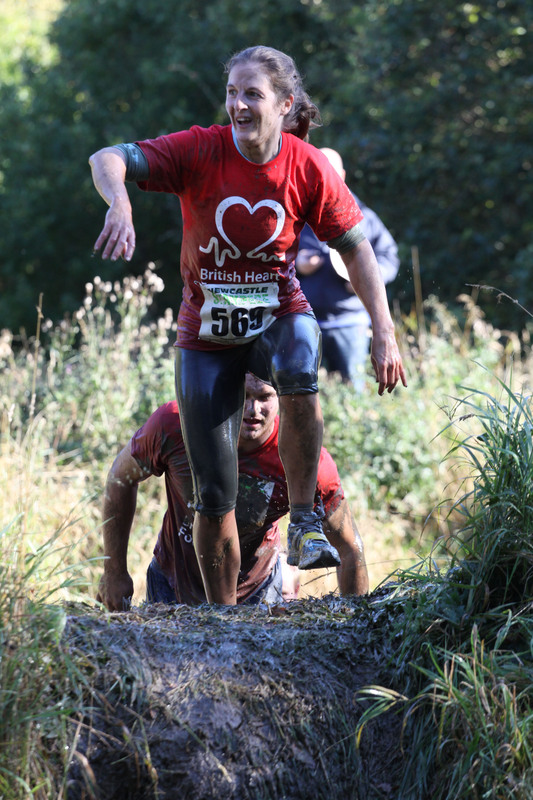 There was a section of the course that ran alongside a long deep ditch and the people running behind me said they’d walked through it the year before and in general, the verdict was there was more running and fewer obstacles this time round. What fantastic, silly, ridiculous fun! Muddy, wet with straw scratched knees and thistle nipped palms. I was grinning all over my face as I collected my medal and goody bag and met up with Ian and Lee at the finish. Back to the car to change, chucking everything wet into a plastic bag and revelling in the feeling of warm dry socks and trainers. I certainly didn’t feel like I’d just run 10k and it was like no 10k I’ve ever done. But I loved it. And most of all I loved knowing that I wouldn’t have even considered it three years ago. The distance, the cold, the mud, the challenge – I would have thought they were all beyond my reach. It was great to share the day with Ian, who got me started on my journey to fitness and still keeps me going, finding new goals and setting new challenges. And that keeps me smiling. I don’t blog much about swimming. I think it’s because there’s no story. I go to the pool, get in, swim a bit, then get out. And apart from a couple of incidents and my long dealt with swim panic, there’s not much to say really. But, like everything else, I really feel like I’ve made progress with my swimming this year. At the beginning of the year I made more of an effort to get a couple of swims in per week so that I’d feel confident about swimming 400m for my triathlons. But actually I think the improvement came through later, when I stopped concentrating on my swimming and just used it as a useful cross training tool. My first breakthrough came when I went up to visit Lesley in North Berwick on the ladies tri day with Ann and Lucy. The lovely light and airy pool, and being happy to be around such good friends spurred me on to swim my first ever 750m set. And even when I did it, I felt like I could have gone on. I’ve started to feel a lot more relaxed and smooth through the water. And I noticed that I’d stopped counting 1,2,3, breathe and as a result found that I could kick a bit harder and propel myself a bit faster. A couple of week’s ago, I timed myself over 500m – my next race distance for the aquathlon at the beginning of November. Without trying too hard I did it in 11:30, after predicting a time of over 12 minutes on my race entry. I was back in the pool again last Thursday night and the smooth gliding sensation was eluding me. As a result, I began to rush through the strokes and was getting a bit fretful about the session. The lane was busier than usual and I guess I was conscious of the other swimmers, although we never got in each other’s way. After a bit of a warm up, not exactly getting in the flow, I intended to swim a 500m set. And even part way through, I’d half convinced myself to make it 400. But I kept going. And then there were only two of us in the lane, so I thought I’d try and make it 760m (20m pool) and actually, by the time I was approaching 600m, I thought I could happily do 1,000m. So I did. It took me 23:30. It’s the first time I’ve done that continuously and it felt like quite an achievement. Two years ago, I celebrated exhausted after just 100m of front crawl. I’m sure there’s a lot I could improve with my stroke, but now I know I have the endurance, I guess I can start playing around with things to help me get faster. It should be a great base to build on next year. I was really a bit unsure about this one. Every time I mentioned I was thinking of doing the Hellhole 10k, my local running pals pals took a sharp intake of breath and muttered words like clarty, mucky and hilly. And in my mind’s eye I could see a photo of Lesley Anne from last year’s race, sporting the ‘couldn’t be any wetter if I’d jumped in the sea’ look. But she was still smiling, so how bad could it be? We’ve had a bit of rain and I was worried about the surfaces and my road shoes, but with reassurance from David and Lisa reminding me that I’d run some of the route with her ages ago, I set off for Stanley, with the intention of enjoying a nice long run in different surroundings than usual. It was all very friendly as I paid on the day and picked up my number. There didn’t seem to be many runners around, but I caught up with David and Anna and spied a couple of parkrun regulars. On the field at the start line it was great to see Jason and Lisa, helping out with one of their local races. Any nerves and misgivings were put aside by the relaxed nature of the gathering and the start, which was actually delayed a little to allow a runner to get to the front of the pack. A whistle blow and we were off. Around the field on the grass and then straight onto a tarmac path and up a steep climb. I picked my feet up and tried to settle into a rhythm. It took me a while to find my groove. Not being sure what to expect, I just tried to relax and run easy. I wanted to feel like I was putting some effort in, but knew I couldn’t compare it to my other 10k road races. So I just ran by feel, enjoying the flat sections out along the river, stretching out my legs and holding onto some energy for the race ahead. The first kilometre markers came by quite quickly and I started to reel in groups of runners ahead one by one. Into the woods and I zoomed down the path, just letting go and relaxing, not trying to fight the downhill, but go with it to pass a couple more runners. This was a really lovely bit of the race. Marshalls had been out and marked the bigger boulders in white, so they didn’t catch you unawares. But the leaf lined paths beneath the trees were really a pleasure to run on. As I passed a stocky runner on a down hill, he gave me directions – just down to the bottom and then turn right. But there were marshalls and tape marking every twist and turn. And I began to recognise the lovely woods that I ran through with Lisa so long ago. I even remembered the steep uphill climb out of them which came at around 5k on this course and I knew it held no horrors. And with a far better understanding of the difference between trail and road running thanks to Lisa’s encouragement, I picked up my feet, shortened my stride and powered up to the top. I’d have had plenty in the tank to keep on pushing, but as we came out of the wood into a meadowy field, the muddy paths proved too slippery to run safely, so I slowed to a walk. We were still climbing and the paths were narrow. When I heard runners behind me I tried to keep to one side and a couple I’d overtaken in the woods came past me. I just didn’t have the grip to push it, so enjoyed the chance of a breather. It didn’t last long though, and as soon as the path began to dry out, I started to run again, back through the woods, enjoying a very different feel from the sea and sky and tarmac paths I usually take. There seemed to be more uphill in the second half of the run. Not so much steep banks and climbs but some deceptive longer rises. Once again in a grassy field I had to slow to a walk to keep my footing, but by being a little braver this time I managed to jog a little and pass a parkrun regular. I shouted out some encouragement as I passed. I hope he wasn’t too disheartened. He regularly beats me over 5k. There were little patches of support thoughout the run and even a water station at 6k. It was great to get the well done’s and encouragement and somewhere around the 4 mile mark I got a shout of ‘Come on Scribbler!’ I looked, but didn’t see where it came from. The final section of the run was back on tarmac paths, although there were still some climbs to come and even a stile to hurdle over. But once I saw the 7k marker, I knew I’d make it comfortably. I even began to regret that I had a handful of more minutes to enjoy this lovely run. My knees were starting to pull a little though and a runner in black ahead had slowed to a walk. I caught him just as he picked up into a run again and said, ‘Not far to go now.’ For a while I could hear him just behind me and used that to spur me on along a nice level path. But at some point he dropped back again and I was out on my own. I started to recognise the turns that were bringing me back towards the start and play the ‘what time do you think’ game in my head as I glanced at my watch. I figured around 58 minutes and was happy with that. And at the same time I realised that the path was actually a little uphill, so I shortened my stride again. At the top was Jason on marshalling duty, pointing the way, saying ‘Just up and back onto the field and you’re all right’. I was surprised as I thought I had a bit further to go. So, one more push up and then onto the grassy field and barely enough time to punch it up for a sprint finish, encouraged over the line by shouts from David and Anna. That will be another race face photo then! I stopped my watch on 56:32 which would be a respectable time for a flat training run for me. So I was highly delighted. With no aims or expectations, this proved to be a great run, which I really enjoyed. Especially as I dived into the race goody bag and found a banana, packet of crisps and a kit kat alongside the technical T-shirt. Oh, and if you’re wondering about the name, the route goes through Hellhole wood. But if you ask me, there’s nothing hellish about this race – although some may disagree with those hills. P.S. I just got an email from Newcastle parkrun director who passed on an email from the lady I helped run her first sub 30 minute 5k yesterday and she was delighted. So, well done Gillian. 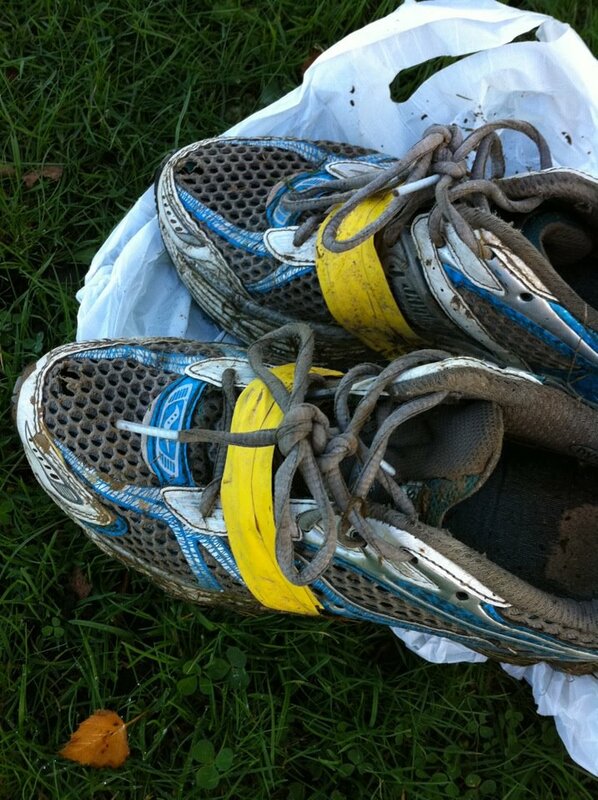 You ran really well and it’s a pleasure to be able to give you a namecheck in my parkrun blog. I turned up at Newcastle parkrun today with only half formed plans in my head. After enjoying the sprints with the running club on Tuesday night, I was in the mood for a fast blast and chasing a potential PB. But I’m also toying with running an off road and hilly 10k tomorrow and wondering what was wise. It was one of our paced runs this week, but when I turned up, there was only a 20 minute pacer. So, when I asked if they needed any help, I was offered a pacing job. For a second or two I considered taking the 25 minute shirt and making myself run at my best. But although I’d understand if I dipped under the time, I didn’t think it would be fair if others were pacing off me and failed to reach their goal. So I adopted the gigantic 30min shirt hoping to make someone happy with a good time this week. Watch set, mind set at 6 min/km pace and off we go. I jog out, easy, easy, warm up pace and keep an eye on my watch. I know I’ve gone off a bit speedy, but really do try to keep it steady and in check. My pace shows somewhere around 05:30 as I keep checking my Garmin. But at the first kilometre mark, I’ve clocked 05:09 – way too fast for anyone using me as a pacemaker. The fact that I can run that kind of pace and find it feels easy shows how much I’ve improved with my running. I slow it down and let myself get blocked in a little behind a couple of other runners. This is usually the kind of position I hate to find myself in, but today I use it to slow down to nearer 5:50 pace. Out across the moor towards the gate, the wind picks up and I can hear the runners around me digging in. A couple running together are encouraging each other. Along Grandstand Road and I’m holding the pace at just under 6min/km. It feels like a nice easy run, but I know this is hard work for many. I draw level with a girl who says ‘Oh no, you’ve caught me! I won’t be as fast as last week.’ I reassure her that I’ve gone off too fast and to keep it going. She tells me she did 27 something last week as she goes ahead and I shout after her that it’s still possible. Another girl with white blonde hair is struggling with her breathing and takes a bit of a walking break. But she’ll be fine. I give her the thumbs up and tell her to come back at me. Back through the gate and onto the smooth tarmac path and the long straight towards the finish. There’s a slight uphill here until the lone lamppost, but the surface is fast and easy. I’m still checking my pace and making mental calculations. I’m running at just under 30 min pace now, but that fast first 2km means I’m well ahead of target. So instead of picking it up, as i would normally do here, I slow it down again, hoping the runners behind can still see me and keep hoping. By the last corner I’m still a good minute and a half ahead, so I stop and jog on the spot, calling back to the runners behind to encourage them on. A man and his young daughter come past hand in hand. I tell them they’ll thrash 30 minutes and offer similar encouragement to all those coming through. They include the girl with blonde hair who looks happy to have made it. With about 30 seconds to go, I spot a lady in a white and pink t-shirt and shout to her that she can still make sub 30. She starts to put a bit of a sprint on. So I go with her down that final straight. “I can’t, I can’t,” she pants, really putting the effort in now. “You can. Just 20m to go,” I shout and keep pushing her to the line. I’m afraid I cross in front of her, which I didn’t mean to do, but I stop my watch at 29:51. As she catches her breath, I show her the screen and she’s delighted. “Is that really sub 30?” she asks, incredulous. “Absolutely”, I say with confidence. “That’s it then, I quit,” she laughs as she goes to pick up her barcode. And it makes my slower than usual run totally worth it. I later learn she’s called Gillian and is a parkrun regular. Well done Gillian. You made my day. It was brilliant to help you achieve your goal and I’m so glad you dug in and went for it in those last metres. I was really pushing you to sprint and you did! I’ve benefited from the pacers in the past, keeping one behind me to record my PB on this course. And I’ve got a lot from parkrun; from the good discipline of getting up early and getting the run done, to some decent speed sessions and learning how I deal with racing and pacing myself. Parkrunners have also been very generous with their Great North Run sponsorship too. So, although I felt a bit strange to have run and not had the big adrenaline buzz of a tough session, it was worth the effort. And with a speed session and an easy run this week, I hope I’ve not set myself up too badly for a run at Hellhole 10k tomorrow. I’m not expecting a PB, but it will be interesting to see how these road runner legs cope with a tough mixed terrain course. And it will be much more interesting that my usual Sunday run. I hope they didn’t think I was showing off. I stretched my legs out as we picked up speed down a hill and got my breath back ready to go again as we waited for all the group to catch up together. It was a still evening, not yet cold and I just wanted to feel the air on my face and let my legs go. Kathryn, who has encouraged my running since the very early days when 2 miles non stop was enough to set me bouncing all afternoon, had kindly given me a lift and introduced me to her lively and friendly club, Wallsend Harriers. A long slope ahead, up to the traffic lights. Not so steep as the local hill I very occasionally run, but more often cycle. Six sprint repeats, chasing a lead runner, making them work hard. I dig in and power up on the tail of the leader. Pause at the top for a breather, then jog back down. And again. Terry shouts ‘Use your arms, use your upper body!’ And I know I have that advantage, so I power on, using the downhill jog to recover and getting set for the next explosion of speed. I’m consistently near the front, never quite catching the lead runner, but always finding the power for another blast. This is fun. I can’t remember when I last sprinted other than the end of a race. The last push right from the bottom, a pause for breath and then we’re off again, running towards a new battleground. Keeping a steady even pace up a longer shallower incline, I feel the rewarding tug on my calves that tells me I’ve worked hard. A dimly lit industrial space. Battle lines drawn facing each other. As the first runner approaches we sprint across no man’s land. Another six rounds blasted out, fast. Race face on. And then a gathering and a run back to our base, sharing running experience and comparing performances. Mixing it up with a couple of fast blasts. It’s nice to get the well dones and encouragement to come back as the three groups meet up and we stretch by the car park barriers. There’s even an invitation to cross-country race this weekend. It’s been fun. And definitely mixed up my training a bit. Would I have run sprint or hill repeats on my own? Maybe. But I wouldn’t have been chasing someone else. The scent of competition spurred me on. I surprised myself at what I could tackle, not having any expectations or knowing what was coming. It was a tough run workout, but I’ve worked harder in my PT sessions. That made me realise I take my fitness for granted. It’s just me, what I do. When I’m training, I like to focus and get on with it. I expect to train hard. As the nights and early morning’s grow darker, it makes sense to run with company and with other faster runners around me, this could be a great way to improve. They’re a friendly bunch and very encouraging, celebrating their recent winners’ success with pride. So yes, I’ll be back to try out the club again to see if that’s my next step.